Already four significant international resort operators have expressed their desire to operate a new, international beach resort on the site – the first of its kind in Southern Africa. Given its sublime warm climate, beautiful beaches, proximity to the berg and the bush and a myriad of natural assets, it’s no wonder KwaZulu-Natal is the market leader for domestic tourism in South Africa and ranks second in terms of international tourism. Starting with the advent of Zimbali Coastal Resort in the late 90s, areas north of Durban including uMhlanga, Ballito and Salt Rock have experienced unprecedented growth in the last three decades with significant return on investment. With the residential and tourist boom and the commissioning of the King Shaka International Airport, other sectors are now also thriving. Schools are mushrooming in the region to support the influx of people and the commercial aspects continue a strong upward trajectory especially with the emergence of the nearby Durban Aerotropolis. Making the north coast more accessible, King Shaka International Airport currently can accommodate 7,2million passengers per annum with this figure expected to climb to 45 million passengers per annum by 2066. The introduction of the new direct British Airways route between Durban and Heathrow London has opened the area up to even more international tourist traffic and cemented the province as a world-class destination. Given its connectivity and natural assets, the region is increasingly being identified by global resort and tour operators as South Africa’s foremost opportunity to compete with other global beach resort destinations, provided critical mass can be achieved. Furthermore, varied business interests and top-quality facilities also contribute to KwaZulu-Natal’s tourism offering. Deighton says, “We just need to look at the numbers to understand how well KwaZulu-Natal is doing. Hotel occupancies have remained above 70 percent with the Average Daily Rate (ADR) growing by eight percent per annum since 2010.” Revenue per available room in the greater uMhlanga area is R1 274 and this sector is forecast to grow by three percent with the uMhlanga market predicted to absorb an increase in hotel inventory over the next five years. Tongaat Hulett believe in shared value creation through responsible and meaningful land conversion activities. Developments such as Zimbali Coastal Resort, the uMhlanga Ridge Town Centre, Cornubia and Sibaya Coastal Precinct have catapulted the area’s desirability as a world-class place to live and work. 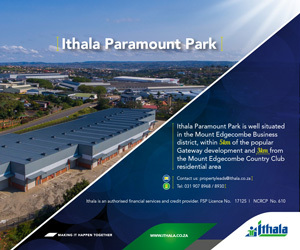 Together with the KZN Department of Economic Development, Tourism and Environmental Affairs (EDTEA), and local municipalities, they continue to keep an eye on key demand-drivers and using their experience to implement best practice, sustainable urban planning and design principles that can best respond to South African society’s changing needs. Deighton says, “While the Durban and uMhlanga areas cater very well to the business and leisure tourism markets, there is still a gap to be filled by a large scale international resort operator”. With essential infrastructure already in place and the potential to improve this concurrently with growth and demand, the region has proved itself as a desired destination and Tinley, a picturesque coastal town ten kilometres north of Ballito, is poised to take on the mantle as the province’s next tourism hotspot. Identified as one of KwaZulu-Natal’s catalytic beach resort developments, Tinley Town will be unlocked in collaboration with all stakeholders. The strategic objective is to create enhanced value in the surrounding assets which will benefit from proximity to and association with the resort and higher pricing premiums as destination value takes hold in the area. Deighton says, “Acting as an economic driver, Tinley will undoubtedly transform the region where real estate and other economic growth opportunities will soar.” The EIA process for the resort opportunity is currently underway with the identification of the international hotel operator soon to be announced.